What is the “importunate band” towards the end of JB’s poem A Subaltern’s Love-song? I’ve seen it suggested the love-sick young officer had accompanied Joan Hunter Dunn to the club dance with an engagement ring. I, however, take it to mean the music from the dance invaded the couple’s car. Betjeman was mostly a closed book to me. I knew “Come, friendly bombs and fall on Slough” and that was about it. Until a few days ago, that is, when I popped into a discount bookshop and came away with The Best of Betjeman (selected by John Guest, published by John Murray). Victorian architecture, parish churches, middle class manners, and most of JB’s other passions fail to register among my interests. But the man’s very English humour inspired his every word and made enthusiasm for his pursuits irresistible. Executive where the poem’s lines “I am a young executive. No cuffs than mine are cleaner;/I have a Slimline brief-case and I drive the firm’s Cortina” would have impressed Ian Dury. I liked Harrow-on-the-Hill where the poet’s imagines: “There’s a line of harbour lights at Perivale” – a particularly unattractive area of London. 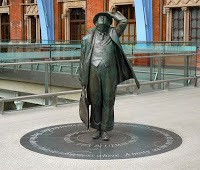 By coincidence I was at St Pancras station earlier today – the subject of one of Betjeman’s prose pieces in the book. His celebration of the station and its Gothic fairy castle hotel (it’s a pity he couldn’t have been around to see its conversion back from offices to its original purpose) is immortalised in the loving statue at the top of this post. The 'line of harbour lights at Perivale' could well be the very unusual and distinctive specially designed low level lights on the A40, in the area of Perivale, which line both sides of the road; the road being very straight at that point. They are so unusual in the context of a dual carriageway, that they are unmissable, especially at night. They are on a flight path to the airport and so have been designed in that way so as not to be confused with airport runway lights, by incoming aircraft.